Perhaps the most well-known principle of photographic composition is the Rule of Thirds. It is the first rule of composition that students in a photography class are taught. The reason for it is that because of the way our brains process images, we find that photos that follow the rule to be balanced and pleasing to our eye. I’ve done another of my lame drawings in Paint to help illustrate what I’m talking about. Think of the black rectangle as your viewfinder or LCD display as you’re getting ready to take a picture. You should try to line up the points of interest in your photos along one of the red lines that I have drawn, and major points of interest should fall at the intersections of those lines, where I’ve drawn the small rounded rectangles. Studies show that our eyes go to these intersections naturally, rather than the center of the shot. Since this is geared towards nature photography, we have to deal with what nature gives us, we can’t re-arrange the landscape, or get creatures to pose for us in exactly the right position to always use the Rule of Thirds fully. However, we should incorporate the Rule of Thirds into our shots as much as is possible. I think one of the biggest mistakes people make when taking pictures, any kind of pictures, is that they focus so intently on the subject of the photograph that they don’t see the entire frame, and what else is going to be in the finished photo. They don’t see that by moving the camera slightly left or right, up or down, or zooming in or out, they could improve their photos immensely. In fact, I would say that it is more important to evaluate the entire scene you see through the viewfinder or in the LCD display than it is to strictly follow the Rule of Thirds, at least to start with. Everytime you are about ready to snap the shutter, see the entire scene you are about to capture, not just the subject of your photo. Think of it as a painting, not a picture. Would you like the entire painting or can you improve it? Now I’m going to tell you to break that rule when you are photographing creatures, at least once. The way I do it when I see a creature, be it a mammal, bird, reptile, insect, anything that may not be there if I wait too long, is to pull up and shoot as quickly as I can to get “one in the can”. Once I have the first one, and if the creature is still there, then it is time to slow down and compose the best shot I can get. Shooting quickly is often the difference between capturing any image of the creature or none at all as it flees. If you don’t practice shooting as quickly as you can, then you won’t be able to when the need arises. Then, if time permits, you can improve on the first shot by taking more time to evaluate the entire scene, and incorporate the Rule of Thirds in your subsequent photos. Here’s another little tip, your eyes and brain will automatically do the work if you let them, by seeing the entire frame. The Rule of Thirds is important because of the way our brains process images, so let your brain process the image before you press the shutter release. I don’t go around thinking Rule of Thirds all the time, but I do look at a scene to see if it will make a pleasing photograph, and then, as I am looking through the viewfinder, I ask myself if the entire picture will be one be the best that it could be, or if moving myself or the camera around will make a better picture. Let’s say that you are taking a landscape picture. Rather than split the screen dead center with the horizon, you should move the camera so that the horizon lines up with one of the two red lines, or close to it. You don’t have to be exact when you are composing your photos, but breaking each picture down into thirds is what creates a pleasing picture. On the right side, you’ll notice I lined up two of the stumps, their tangle of small roots, and the edge of the hill they are on about one-third of the way in from the right edge. The sky on the far right is about one-third of the frame from the top,but doesn’t form a straight line. The base of the stump in the center of the frame is about one-third of the way up from the bottom edge of the frame, and the stump covers about the middle third of the frame. The roots from the stump in the center go out from it to about one-third of the frame on each side, leading your eye back to the stump itself. The left third of the frame is more or less empty, other than letting people see that this was taken along a lake shore. In a perfect world, the stump in the center would have been slightly farther to the left compared to the roots and stumps on the right, but if you go back to my drawing, you’ll see that the stump in the center “fills” the center box formed by the red lines. Why did I choose to use this picture as my first example when it doesn’t follow the Rule of Thirds exactly? Let me tell you the story of how this picture came to be. 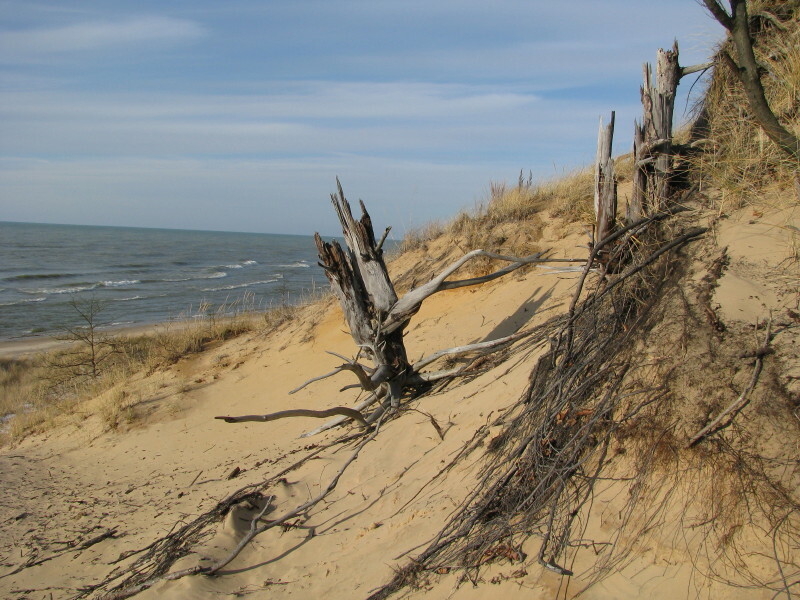 I saw the stump in the middle with its double root systems and how the sand had been blown away from them leaving them exposed, and thought “What a cool stump, it will make a good picture”. Rather than just pull up and shoot from where I first saw the stump, I walked around it in a semi-circle until I found the best angle to shoot from, one that provided the best backdrop for a picture of the stump. Once I had the best angle, I zoomed in and out, moved slightly left and right, tilted up and down, until I saw the picture you see here, when I pressed the shutter release. Not once did the Rule of Thirds enter my mind, instead, I was looking at the LCD display and changing the composition until my brain told me “That’s it, shoot”. Maybe I was thinking Rule of Thirds on a subconscious level, since I know the rule, and do think of it from time to time. It wasn’t until I analyzed the picture that I realized how closely it followed the Rule of Thirds. This is also an example of a classic way of composing a scenery shot, using things in the foreground to “frame” the view. 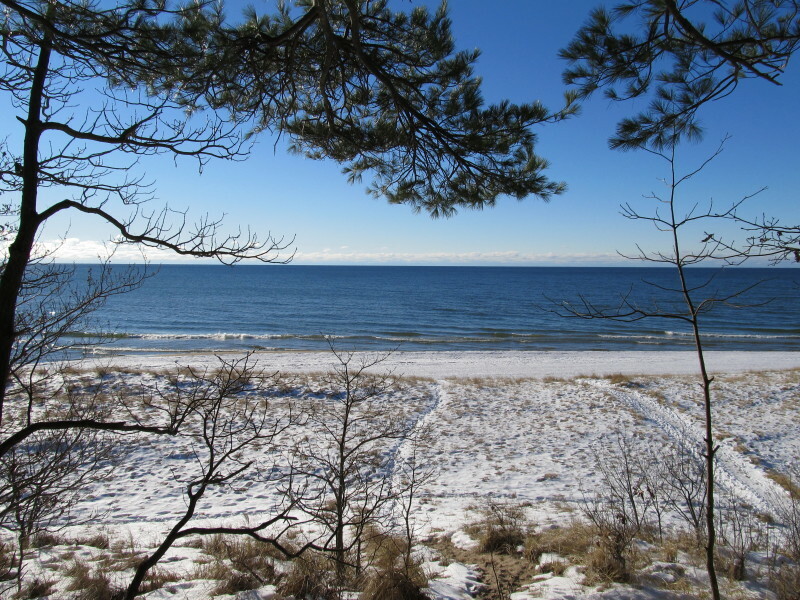 In this case, I used the overhanging branch from a pine and the bare branches of the trees to frame the view of the snowy beach on Lake Michigan. I could have stepped forward a few steps and cut the things in the foreground out, but I didn’t. I actually zoomed in to this point, with the overhanging branches at the top about one-third of the way down into the picture. Without the framing of the things in the foreground, this would have still been a good picture, but a rather boring one. As long as what you use to frame a scene doesn’t overpower the scene itself, this is a very good way of adding visual interest to your pictures, and it’s a trick the pro’s use often. And once again, I wasn’t thinking Rule of Thirds when I shot the picture, I was looking at the entire scene in the viewfinder, moving the camera around a little, zooming in and out, and until the scene was the best it could be overall. For wildlife and flowers, I believe that if you can follow the Rule of Thirds that you should, but it is more important to get close to your subject, and with wildlife, capture their personality. First example. When first saw her, she was on high alert, frozen in place tight against the branch hoping I wouldn’t see her. 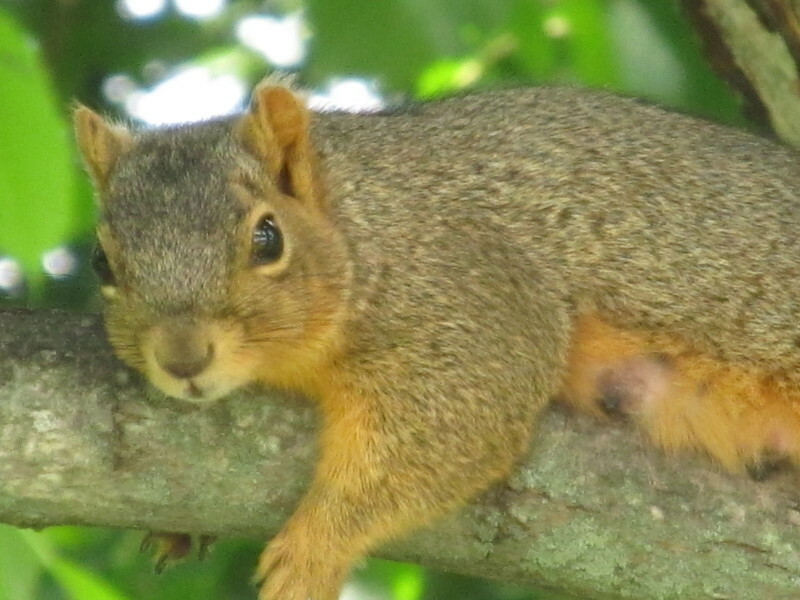 After a few minutes, she decided that I wasn’t an immediate threat, and she went limp on the branch, obviously relaxing from her busy day of caring for her young. I can’t see how this fits the Rule of Thirds in any way, but it is still a great picture. Example two, also a squirrel. Here’s the story behind this one. My Canon Powershot has several different options for sound, you can set it to be silent, or choose from several different options for the sounds it makes as you turn it on and adjust the settings. One of the options is bird sounds, and I have found that setting to be helpful in putting most wildlife at ease when I am operating the camera. 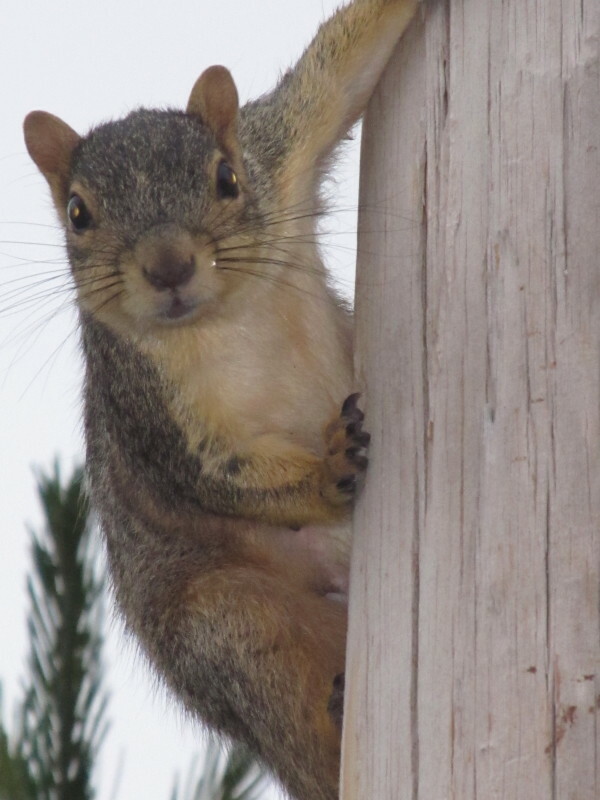 This squirrel had hidden much farther behind the pole when we first saw each other, but when I turned on my camera and it played the sounds of birds chirping, the squirrel came back out from behind the pole to see what was going on, which is when I snapped this one. One thing I should say is that while the bird sounds from my camera does seem to put animals at ease, it does seem to frighten off insects that may become a meal for a bird. It may be my imagination, but I don’t think so, it has happened too many times. I get curious looks from animals, but insects take off when they hear the camera making bird sounds. Here’s one more animal photo. Again, I didn’t follow the Rule of Thirds in this one, but getting close enough to see this deer’s whiskers is what makes it a special picture. OK, so I did sort of follow the Rule of Thirds. The deer is in the center third of the photo, and framed by the trees behind her. You may notice that there is a tree about one-third of the way into the photo from each side. 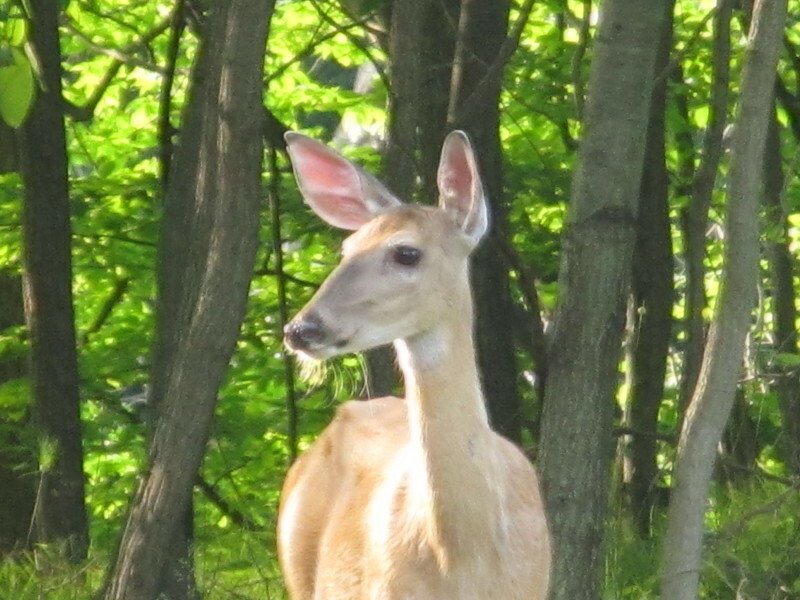 Also, the doe’s eyes are about two-thirds of the way up in this picture. She does have a tree “growing” out of the top of her head, but it couldn’t be helped, I didn’t have a chain saw with me. When I am photographing animals of any type, my main focus is their eyes, I try to look them in the eye through the camera. Here’s another little tip, don’t look animals in the eye unless you are looking through the camera. If you do look an animal in the eye directly, it makes them uneasy, and they will probably scurry off away from you. Think about it, have you ever had the feeling some one was staring at you and when you looked around, some one was? Animals have that same sense, I avoid making eye contact with any animal until I am looking through the camera. That doesn’t seem to bother them at all. I can’t tell you the number of times I have been walking through the woods and felt eyes on me, and when I looked around, found a deer, squirrel, or some other animal watching me as I walked past them. And, I can’t tell you the number of times when I have been watching an animal for a while, then felt it as we made direct eye contact, only to have the animal run off. I look at wildlife photography as portrait photography, taking portraits of animals rather than people. And while the Rule of Thirds still applies to some degree, it isn’t as important as capturing the personality of the subject of the portrait. It helps if you can place the animal’s eyes or eye at one of the intersections of the imaginary lines that make up the Rule of Thirds, or on one of the lines, as I have more or less done with the squirrel pictures above. A couple of people have told me that it looks like the animals pose for me when I take their pictures, that isn’t quite true, but it is close. I’ll have a lot more about that on a page devoted to just animal photography, but for now, I’ll say, don’t settle for one picture, then give up. Shoot one picture quickly to get at least one, then watch and see what the animal is doing, and continue to shoot pictures until it runs off, or you are positive you have a great photo. The same holds true for flowers, I look at them as a portrait of a flower, the closer the better, even if they more than fill the frame, and even though flowers don’t have personalities. Or if one flower doesn’t fill the frame, fill it with multiple flowers like in this one. 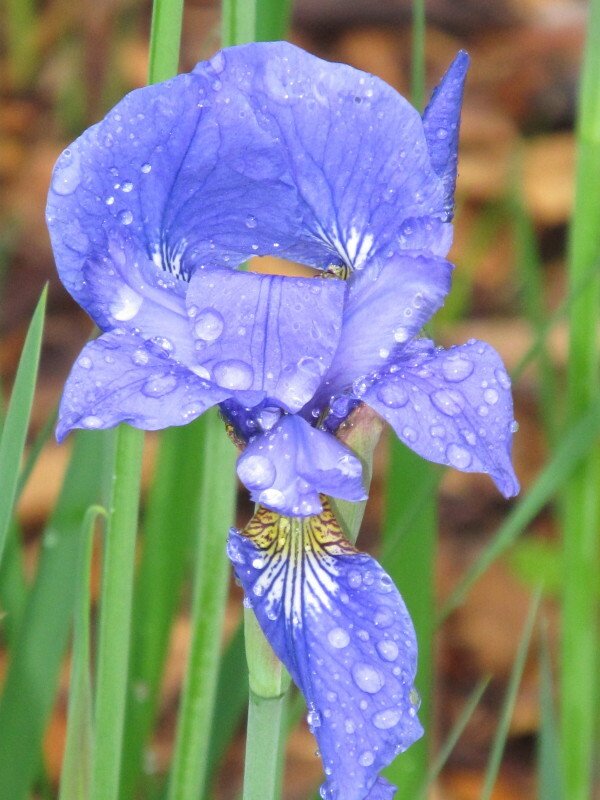 If the flower is by itself, and small, then place the center of the flower on one of the imaginary lines, or at one of the intersections of the lines by following the diagram for the Rule of Thirds, such as in this photo. The center of the flower isn’t exactly at the intersection of the lines following the Rule of Thirds, but it is close and by offsetting the flower up from the center, it makes a more pleasing photo than if I had centered the flower exactly. 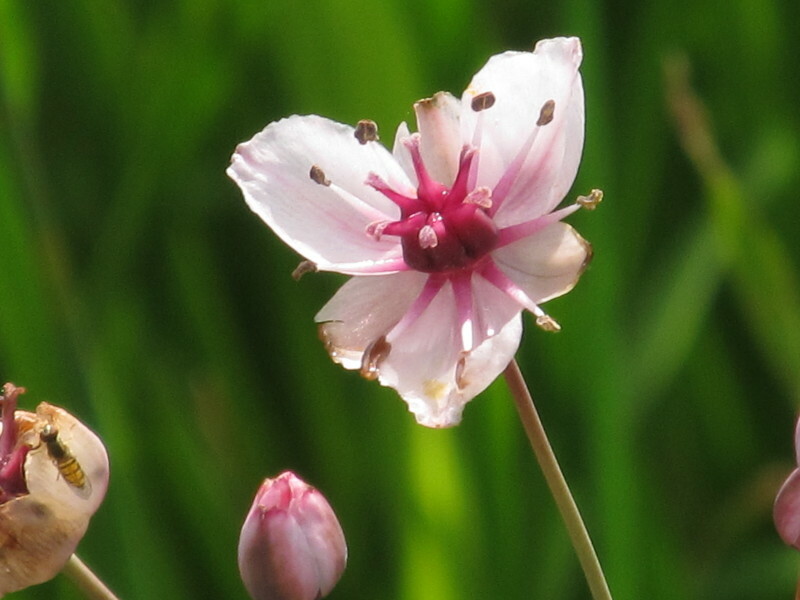 To me, lighting and background are more important than the Rule of Thirds when photographing flowers. However, you are still somewhat limited by what nature gives you to work with. The good thing is that we often have many subjects to choose from, for flowers normally grow in bunches. That means that rather than picking one flower or group of flowers completely at random, you should look at all of them with a critical eye towards choosing one, or one group, that will yield the best photo. Sometimes it isn’t the biggest or most brightly colored flower that will yield the best picture. 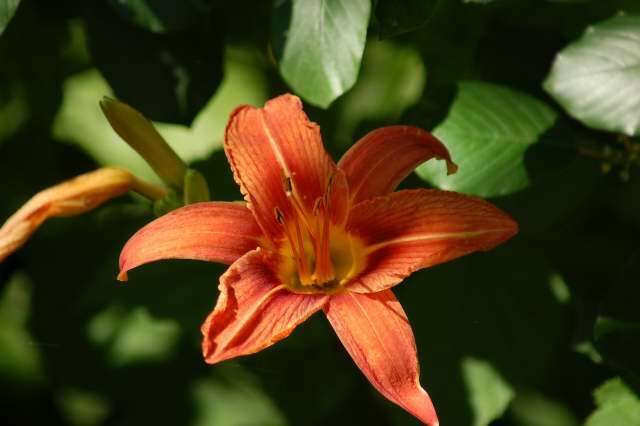 Take the photo of the day lily above, the color, lighting, and background are what makes this a good photo, even though the flower itself is wilting. When you come upon a bunch of flowers, you should scan them all, and from different angles, to see how the lighting and background will play out in your photos, then choose the flowers to shoot based on that. Some flowers look better when photographed with soft, shaded lighting, such as this one. 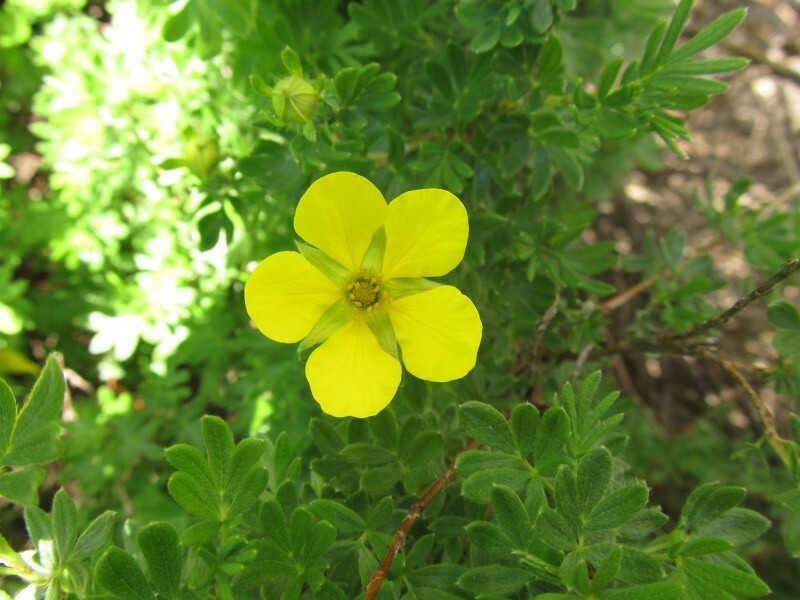 Photos I took of the same type of flower shot in full sun weren’t as pleasing, the light was too harsh for this type of delicate, yellow flower. You are going to have to experiment, because I have found no hard, fast rule as to what type of lighting works best. Some flowers present special problems due to their shape. Deep, cup-shaped flowers such as tulips are harder to photograph than are other types that are flatter. 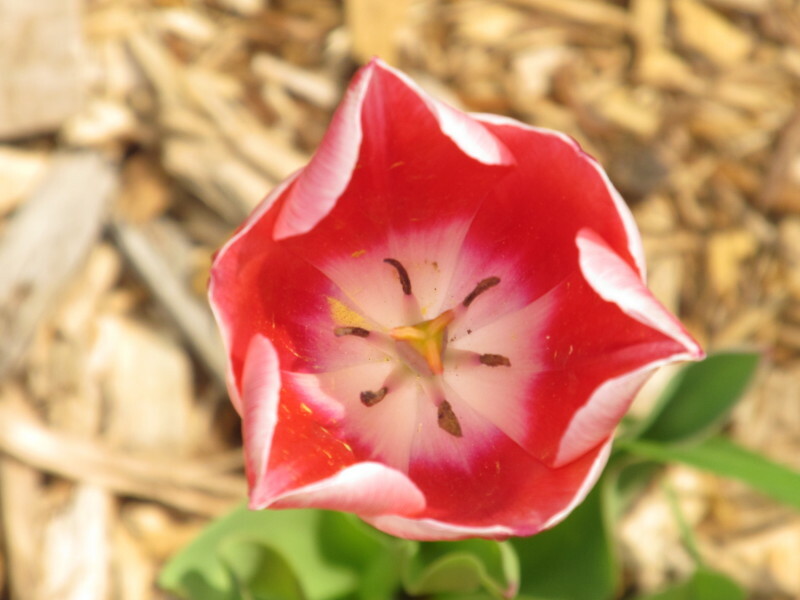 For the inside of deeper flowers, such as this tulip, I prefer to hold the camera farther away and use the zoom feature of my camera to get closer, shoot from directly above the flower, and use fill-in flash to light the bottom of the inside of the flower. Without the fill-in flash, the inside of this tulip would have been dark and all detail lost. Flowers don’t have personalities, but they do have color, form, and texture, and those are the things I try to capture when photographing flowers. 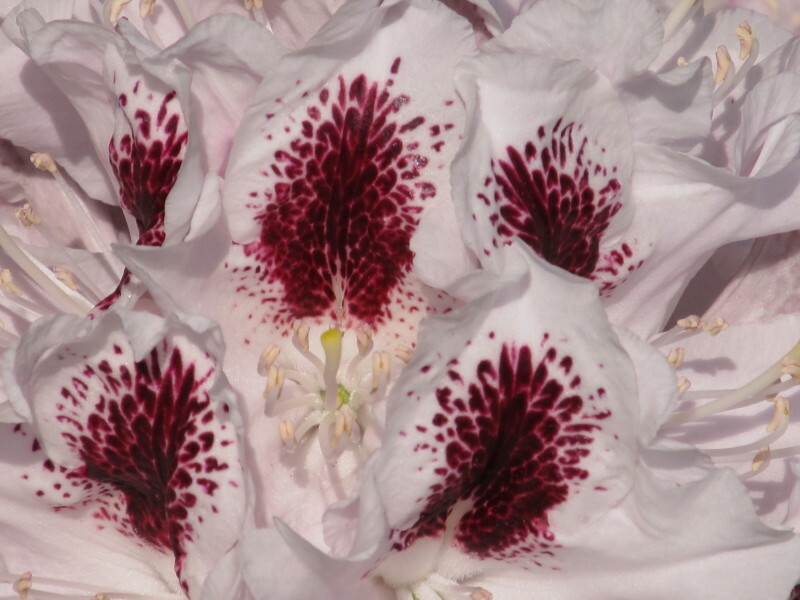 Compare the soft, billowy texture of the rhododendrons to the harder, stiffer texture of the day lily for example. 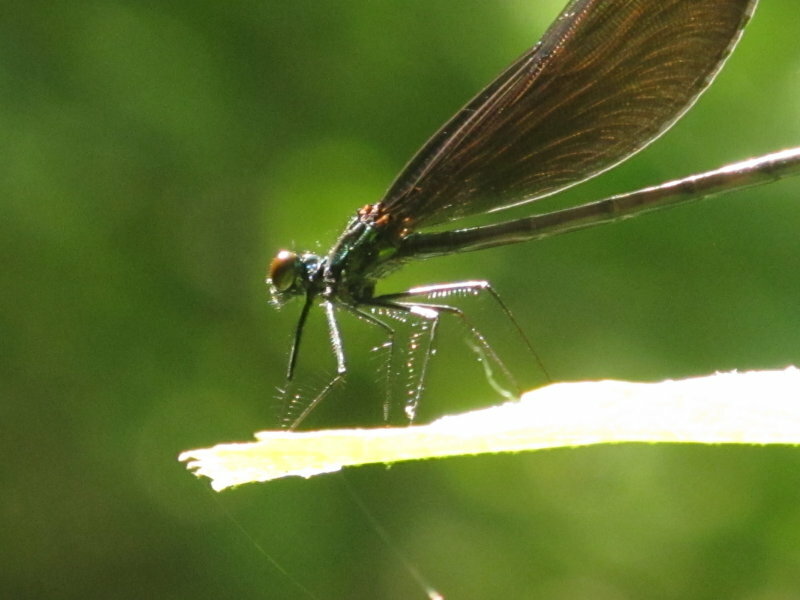 Even insects can make a good subject for a photograph, if you get close, like in this one. 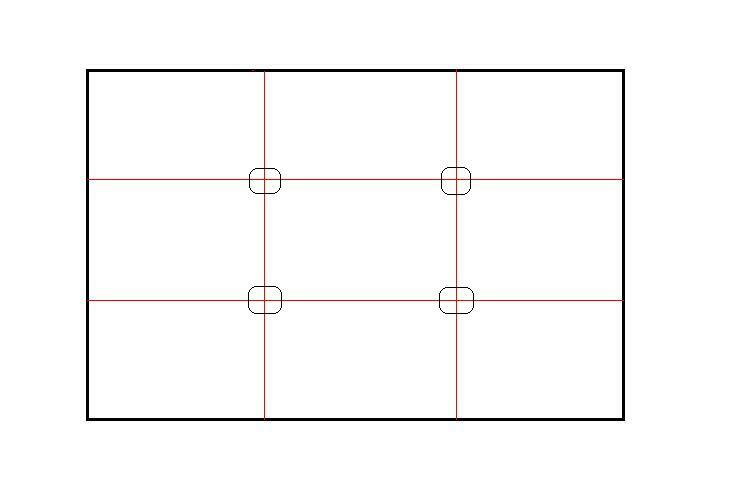 I’ve spent most of this so far explaining when not to follow the Rule of Thirds, so when should you follow it? Any time that you can, and it works for the picture you are trying to capture. You should mentally break the view you see in your camera’s viewfinder into thirds, and remember the four points where the lines intersect and try to compose your photos using the Rule of Thirds. I would suggest that you practice composing to the Rule of Thirds for a while until it becomes second nature to you. Just as important to good photos is learning to see what the entire frame will be, not just your subject, and learning to see the world in terms of photos. As I am walking along, I will notice something that may make a good picture, and in my mind, I am already seeing it as it will appear in the viewfinder, before I even bring my camera up to my eye. That comes from taking many, many photos, and taking them on a regular basis. So my advice is this. Keep the drawing that I posted here in mind, and practice shooting to the Rule of Thirds. When you see a subject you think may yield a good photo, analyze the setting, ask yourself if it would look better from another angle. You may find that by walking around a subject that you’ll be able to get several good, but completely different photos, of the same subject. Notice what the background and the foreground will look like in your photo, and ask yourself if it can be improved on. Look at the entire frame before you press the shutter. The chances are, if it looks good to you in the viewfinder it will be a good picture. Remember, your eyes and brain will automatically do the work if you let them, by seeing the entire frame and taking a second or two to see what the finished photo will look like before you press the shutter. Something else that may improve your photography is to view paintings of nature, and I would recommend the works of the old masters, not modern art. I think that looking at the paintings by the Impressionists or the Dutch Masters is a very good way of training your eyes and mind to see the world in an artistic light. I know that it helps me in both my composition and lighting, because, after all, both painters and photographers have the same goal in the end, portraying the beauty of nature. Painters have the luxury of being able to create from scratch and aren’t bound by the limits of the physical world, they can move trees and even mountains to where ever they like in their paintings, something a photographer can’t do. But, the idea is the same, and great art is great art. It will help you to see the entire scene in your viewfinder if you look at it as art. One thing I would recommend against is viewing the photographic work of most of the modern photographers. Their work has been so doctored that there is no way the average person’s photos will compare to their’s, plus, they have much better equipment than the average amateur can afford to begin with. I would recommend viewing the works of Ansel Adams and some of the other older nature photographers to learn more about composition and lighting. I’ve had a read. Now I must heed. I’ve missed so many good photos while messing about with the camera. Point and shoot first. Pleasing photo second. Rule of thirds, third. Is that about right? Yes, that’s about it. You can’t edit the photos that you don’t get. So, my first concern is to get something. If it looks pleasing to the eye in the veiw finder or LCD display, it is probably OK as is. If not, I can usually crop to follow the rule of thirds if need be. I never really thought about it but the crop function shows the rule of thirds. I whizz it around and stretch and shrink it until it looks good, so I’ve been using the rule of thirds without knowing it! I can use it knowledgeably now, so thanks.